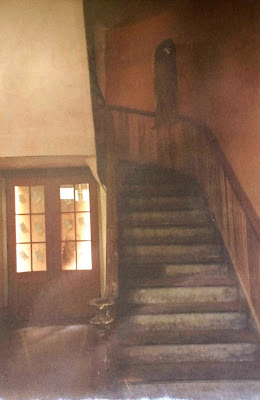 From time to time, in this blog and elsewhere, I've criticized the obliteration of the past to "make way for progress", as innumerable articles in the Los Angeles Times used to put it in the postwar decades. The word progress, in this context almost always meant that the old buildings would be replaced by a freeway or parking lot. If not that, then it generally was going to be some civic building that would be surrounded by extensive greenspace and surface parking, thereby imposing a suburban aesthetic on the very center of town. The Plaza neighborhood has been especially hard hit, as most of the buildings that used to share the west side of Main street with the Plaza Church were eventually razed to make way for parking, as was the entire block to the north (see The Life And Times Of Block 50 and Block 50 In The 20th Century, also in this blog). 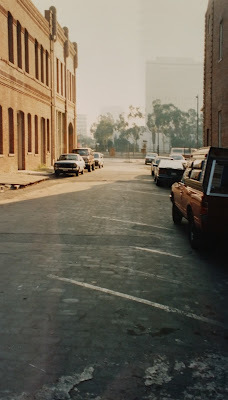 The opposite side of the Plaza, on Los Angeles Street, fared no better as the last remnant of Old Chinatown was cleared away in the early 1950s to make way for more of the same progress described previously. 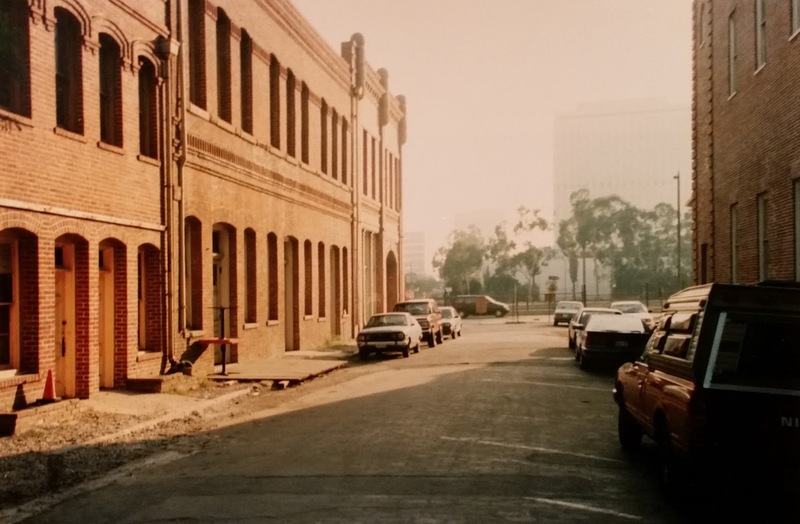 Pico House (1869-70) and Brunswig Drugs building (1888), as they appeared in the early 1990s. I shot the photo above in the early 1990s, when both the Pico House and the Brunswig Building stood empty and, in the case of latter, sadly derelict. Close inspection of the Brunswig reveals boards in some windows, and missing glass in others; since it was last used by the county courts in the 1970s, it had never really been used for anything. Sometimes, though, miracles do happen. 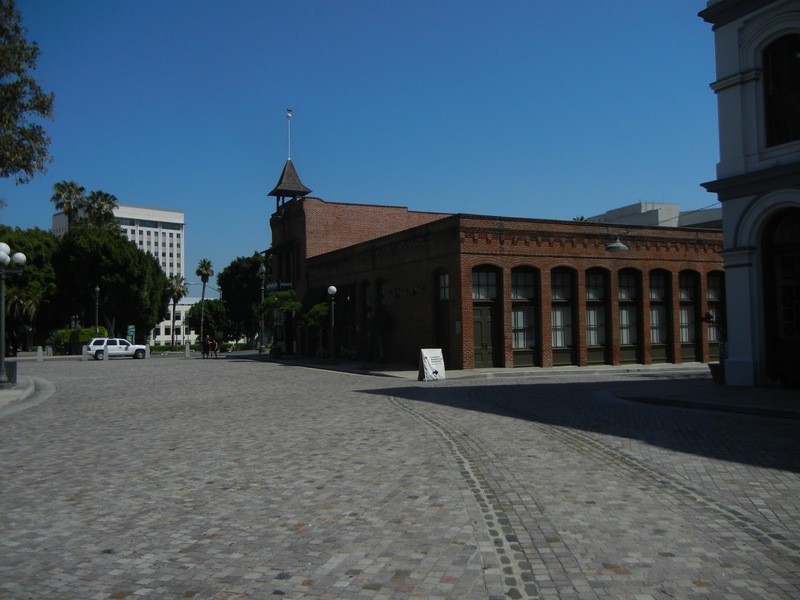 When the Brunswig Building and the adjacent Plaza House were remodeled to become the L.A. Plaza De Culturas Y Artes, the exterior of both buildings was improved beyond all knowledge, as this more recent photo from 2012 shows. The Pico House, too, has been getting some use as an exhibit space, and has been extensively renovated. From a slightly different angle we get a better view of the buildings across Main. 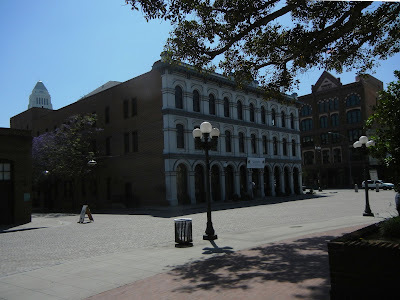 From here, if you turn left around the corner of the Pico House and head a few yards down Main, you can see further evidence of improvement at the Main Street entrance to the former hotel. First, though, consider another photo from the early 1990s. Dimly visible near the top is one of the niches which were populated by marble statues, in more prosperous times. Curiously, the markings or stains in the niche almost give the impression that a statue still stands there, which wasn't the case. I don't remember exactly why I only got one side of the entry, but the most likely reason is that all the other windows that looked into this space were papered over, as the ones opposite. Pico House main entry and stairway as it appeared in the early 1990s. Here is the same entry today. Sanchez Street, or what's left of it, runs from the southern edge of the Plaza to Arcadia Street, between the Pico House, the Merced Theater, and the Masonic Hall on the right, and the Hellman-Quon Building and the Garnier Building on the left. 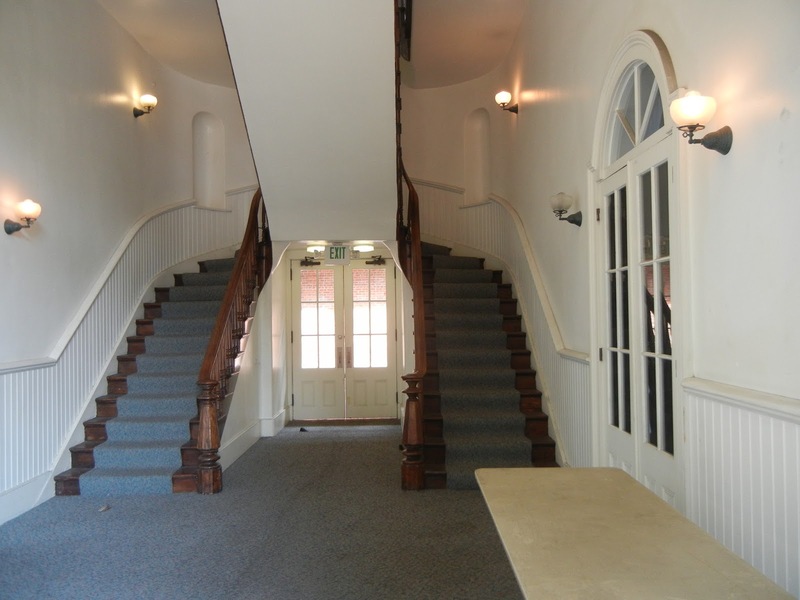 For most of the latter half of the twentieth century, this narrow way was used for service access to the buildings, as needed for maintenance and occasional spurts of remodeling over the years. Otherwise it was usually closed to the public. We'll start again with the early 1990s image. The most notable feature here is the pavement of slag blocks; this was very rare in the city twenty-five years ago, and today is even more so. The angled parking spaces must have been left over from the time when Sanchez Street, and the Plaza itself, were still open to motor traffic. By 2012 the slag pavement was gone. The loss of such a basic infrastructural relic of an earlier time might dishearten some people, but the improved overall appearance can't be denied. Now that's progress! Sanchez Street looking SE, 2012. The Garnier Building is visible ot the right, beyond the tree branches. 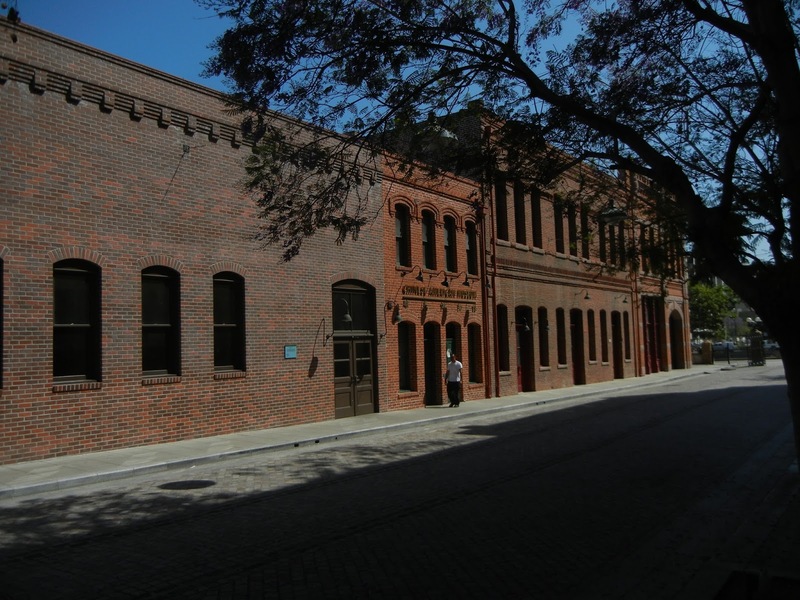 The Chinese American Museum occupies the Garnier Block today, and in fact this block was once adjacent to Old Chinatown. To provide further geographical context, here is the SE corner of the Plaza and Sanchez Street. Southern edge of Plaza, looking SE. 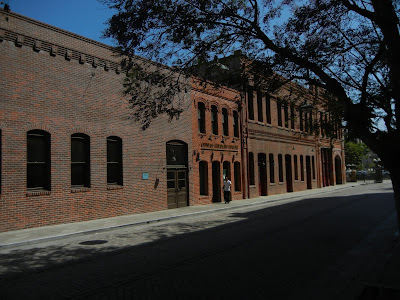 A corner of the Pico House is just visible near the right margin, and the Hellman-Quon building (1900) is across Sanchez, in the middle of the frame. Beyond it is the the old firehouse (1884), with its fire helmet-shaed weather vane.